General Electric (GE) announced a slew of major strategic initiatives today that will ultimately result in another dividend cut within 12 to 18 months. I estimate the dividend could be reduced by as much as 35%. Specifically, the company decided to spin-off its healthcare segment (23% of profits in 2017) and divest its ownership stake in energy company Baker Hughes (BHGE). The healthcare spinoff is expected to happen within the next 12 to 18 months, while the separation from Baker Hughes will take closer to 2 to 3 years. The remaining GE will consist of its Aviation, Power, and Renewable Energy businesses, along with GE Capital. 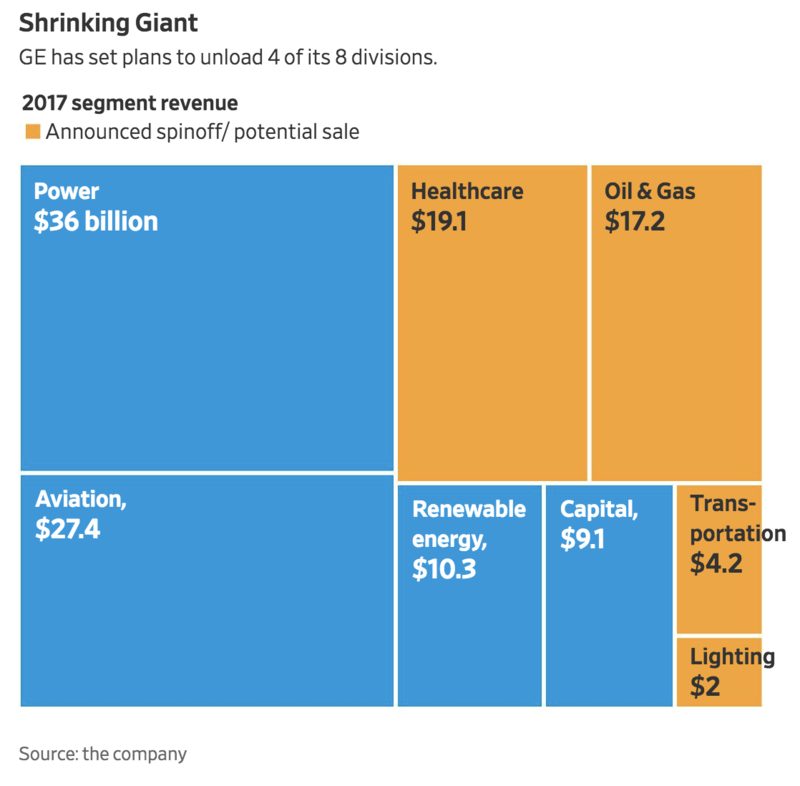 The Wall Street Journal provided a helpful graphic below highlighting how GE is shrinking. GE is making these moves to simplify its operations and hopefully become more focused and profitable. A key driver is improving the company’s financial health, too. 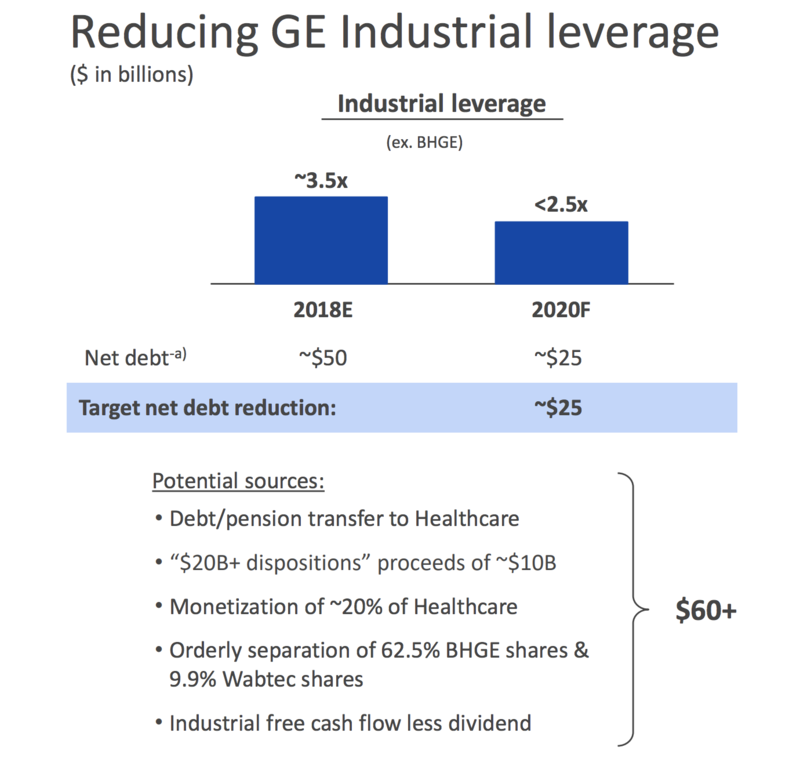 GE is looking to reduce its debt by $25 billion by the end of 2020, which will lower its industrial division’s net debt to EBITDA leverage ratio from 3.5x to less than 2.5x. To get there, the company is monetizing some of its assets (20% of GE Healthcare will be sold rather than spun-off to current GE shareholders) while also shoveling off some of its debt and pension liabilities to the new healthcare spinoff. These actions could be in the company’s best long-term interest. However, a shrinking GE means less cash flow, which will ultimately result in yet another dividend cut from the company within 18 months (as soon as the healthcare spinoff completes). So we won’t know for at least another year what the total dividend cut will be, but my best guess after doing some rough math is somewhere between 15% and 35%. GE Healthcare generated $3.4 billion in profits in 2017. The average healthcare company in our database has an earnings payout ratio near 30%. Let’s assume the new GE Healthcare Board prefers to stay conservative in the early days and retain as much cash flow as possible to continue growing the business (and service the large liabilities GE is sending with it). A payout ratio of 25% would result in $850 million in annual dividends paid. Since GE shareholders will only own 80% of this business (GE is monetizing the other 20%), they would be entitled to receive $680 million in dividends. GE’s remaining industrial businesses (Aviation, Power, Renewable) combined to generate $10.1 billion in profits in 2017. The average large cap industrial in our database pays out 35% of its earnings. Again, I think it is a good bet that GE will remain more conservative with its payout ratio to take pressure off (especially given deleveraging needs and depressed power markets). If we assume GE’s board opts for a 25% payout ratio, the company would pay $2.5 billion in annual dividends. The headline would be ugly since $2.5 billion is a 40% reduction compared to GE’s current dividend, but you have to remember the dividends you will receive from GE Healthcare. In this scenario, the remaining GE ($2.5 billion in dividends), combined with shareholders’ new 80% interest in GE Healthcare ($680 million in dividends), would pay around $3.2 billion in dividends each year. GE’s current dividend payment amounts to $4.17 billion each year, so this scenario would result in a total dividend reduction of 23%. If the company ran with a 20% payout ratio for both businesses instead, the combined dividend cut would stand near 35% using 2017 profit figures. Meanwhile, a 30% payout ratio would result in a much more minor dividend reduction near 3%. From an income perspective, GE’s risk profile has clearly deteriorated yet again, at least over the new few years. If you need to rely on the company’s current dividend and can’t handle a potential 30%+ dividend cut, this stock isn’t for you. However, investors have pushed up GE’s stock price by 7% on this news, demonstrating their enthusiasm for management’s turnaround plans. The last year has been filled with uncertainty and various unexpected challenges, so any clarity on the company’s strategy is a win for now. The “new” GE will be more focused on a lucrative business with Aviation accounting for close to 70% of profits (up from about 45% in 2017), and it will be in a much healthier financial state should GE’s deleveraging efforts and healthcare spinoff succeed. Management’s plans are far from guaranteed to be successful and don’t solve the company’s struggles in the power market, but they represent a big step in hopefully the right direction. For investors searching for a progressing turnaround story and worried less about dividend safety, GE is looking a lot more interesting after today’s news.